Not all gifts are tangible. After suffering the loss of her father while writing her bestselling debut book, Amy Hollingsworth began to search for the meaning behind his dying moments. What she found was a simple truth at the heart of overcoming the deepest grief: the dying leave gifts. 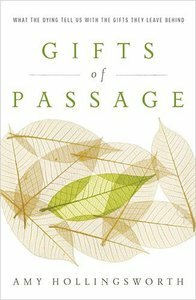 With deeply moving stories of how others discovered the gifts their loved ones left behind, this book will gently encourage you to anticipate and uncover your own. Weaving together the warm intimacy of Mitch Albom's Tuesdays with Morrie and the straightforward honesty of Joan Didion's The Year of Magical Thinking, Amy Hollingsworth adds her hopeful voice to the literature of life and the life beyond. The result is a collection of stories that gives the reader myriad ways to identify their own pain and healing and is an intriguing journey for any and all readers fascinated by this brief overlap of heaven and earth. From the bestselling author of The Simple Faith of Mister Rogers. Amy Hollingsworth is the author of The Simple Faith of Mister Rogers: Spiritual Insights from the Worlds Most Beloved Neighbor, based on her nine-year friendship with televisions Fred Rogers, and Gifts of Passage: What the Dying Tell Us with the Gifts They Leave Behind. She has a masters degree in counseling psychology and a bachelors degree in English and is an adjunct professor at the University of Mary Washington in Fredericksburg, Virginia, where she lives with her husband Jeff and their children, Jonathan and Emily. She has written for various magazines, including ParentLife, and was a writer for eight years for The 700 Club television program.